KFWE Event is the official mobile application for Royal Wine’s KFWE events, the largest Kosher Food & Wine events in the world! KFWE Event delivers you the perfect mobile companion for every Kosher Food & Wine Experience event by offering you unprecedented access to all our amazing vendors and their delectable kosher offerings. 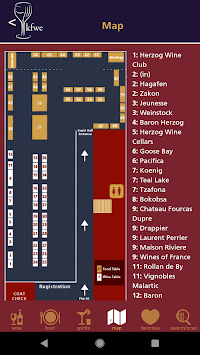 Seamlessly browse a myriad of world-renowned wineries, distilleries, and restaurants, and instantly locate their booth. 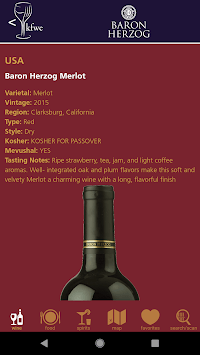 Jot down your observations and impressions of our favorite samplings in your Notes, and save a list of your favorite kosher wines, spirits, and dishes for later. Looking for a particular wine or spirit in the app? Use our handy Barcode Scanner to instantly bring more information on the product you desire. 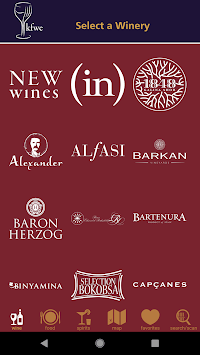 Enhance your Kosher Food & Wine Experience with the KFWE Event companion app. We look forward to you joining us for another magical evening. See you there! We’re always looking to make the experience better and easier. Thanks to your feedback, this update includes a new "Search" feature, bug fixes and performance updates.